GOOD MARKET IS ON ITS WAY! We want to sell your work for you! GOOD Market is a pop-up shop featuring one of a kind goods from Portland State Art+Design students. It is only $5 to participate and you keep all the profits that you make. Applications are due Monday 11/26—Apply today! Follow us on Instagram to stay up to date on any event announcements and to find great ideas for things to make and sell! Good Market is Friends of Graphic Design’s amazing holiday market featuring one of a kind goods from PSU Art + Design students! Here you can find: art prints, holiday cards, zines, posters, jewelry, buttons, stickers, and much more – all available for sale directly from the artists. 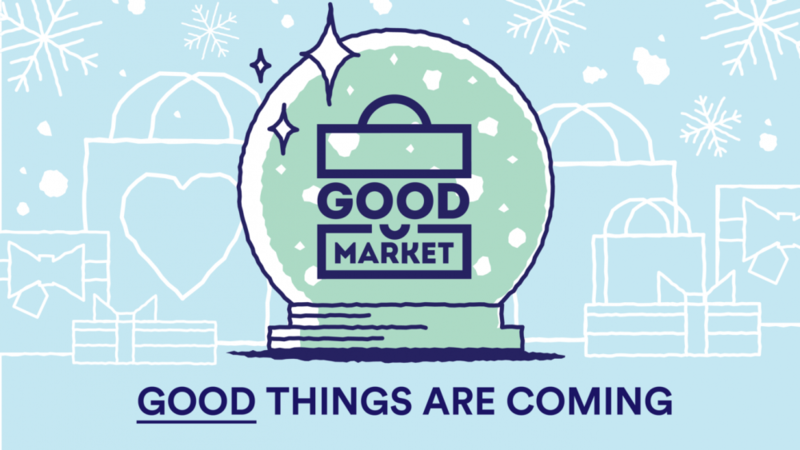 GOOD Market takes place at the end of fall term and during the Be Honest student showcase in spring term! Dates vary but the market always takes place on a weekend. Who can sell their work? GOOD Market is open to all PSUGD students! You can sell anything—do you have illustration work from class? Lettering that you could turn into cards? Make prints of it! Make cards! Make all the things! You don’t have to do extra work to sell at GOOD Market. All you need to do is apply and pay the $5 fee. Anything! Cards, wrapping paper, pins, gifts, socks, soap, leather goods, whatever you like to make. Keep in mind that you can’t always turn a school project into a marketable good without a bunch of editing, but we love to see projects and illustrations turned into art prints or cards. ** Please note, due to limited space each seller will be limited to 5 pieces each (multiples/prints of each piece are highly encouraged within reason). If you’re concerned about the size of your piece(s), please verify with us.For legal reasons we request that you do not make fanart of any existing piece of media or make anything that may get us sued. Let’s make original work! How do I apply and what is the deadline? To apply fill out this Google form. The deadline for the Fall 2018 GOOD Market application is Monday 11/26. We will not accept drop-offs of product without the $5 fee and will not be taking drop-offs past Thursday 11/29 @ 8:00PM. How do I price my work? How do I package it? Things vary. For most things people usually stay under $25, cards are around $6, but handmade goods are up to interpretation! A good place to start is to look at sites like Etsy or to think about what similar hand made goods would cost out in the world. In the past students have had success with cellophane bags. You can find them in art stores, craft stores (like Columbia Art Supply who is known to have sales! or Blick, Michaels, etc. ), or on Amazon! Sharing with a friend is a great option since they’re often sold in bulk. You’re welcome to not use cellophane bags, but packaging is required. Keep in mind that we have to have somewhere secure to put the vendor tag, please don’t make us tape or staple something directly to your work. Can I volunteer to help with GOOD Market? YES! Please and THANK YOU! If you are selling in GOOD Market we encourage you to volunteer. If you aren’t selling and just want to hang out we would love to have you too! We need a few volunteers to assist us with set up, manning the money and selling, and tearing down. Please email us at psugoodmarket@gmail.com for more information. To volunteer go to our SignUpGenius page. When/where/how do I drop off my stuff? Bring your goods, completed Vendor Form, and $5 in an envelope with your name and email written on the back to any of the drop-off dates listed below. Please have everything pre-packaged and ready to go, with vendor tags attached to all items and Vendor Form filled out. The last day to drop off is Thursday 11/29 at 8:00PM. In order for your application to be considered complete, we must have received your completed answers to the Google form by Monday 11/26 and your $5 application fee and goods by Thursday 11/29 @8:00PM. We will not be accepting late submissions and we will NOT allow people to drop off goods on the day of the event. How many items should I sell? We accept 5 unique pieces of inventory—how many of each of those you bring is up to you, however we ask that you don’t include more than 10 of each unique piece of inventory. There is very little space for us to store extra stuff so please take this into consideration. Please download and complete the Inventory Form and the Vendor Tags for your work. Students are required to submit an Inventory Form when you drop off your goods with your $5 and ALL items must be tagged with a vendor tag. Items without tags will not be accepted. Please feel free to email us! Always happy to answer any questions and work to accommodate your needs as much as we can. Here are some examples of student work that are great ideas for products for GOOD Market.